Fresh ahi poke is one of the most beloved meals in Hawaii. Alone, on rice, or as part of a salad, poke can be enjoyed in many ways. 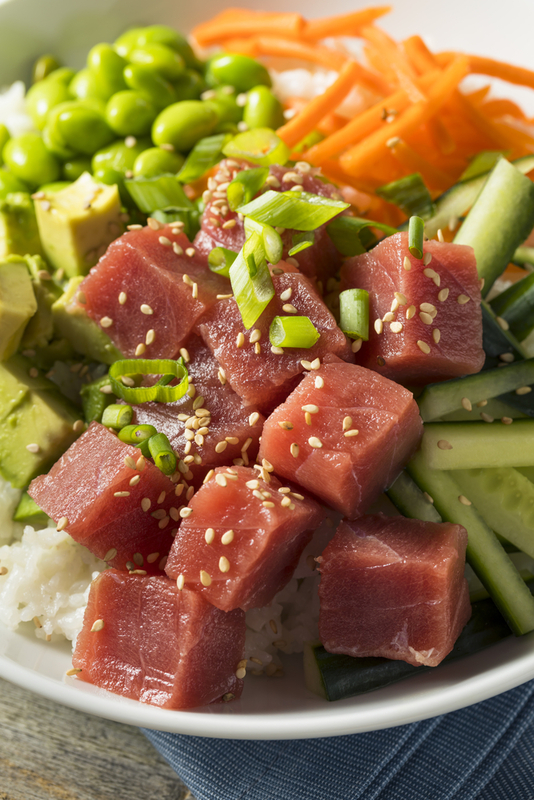 Poke & Box in Honolulu, HI, is proud to offer the freshest fish on Oahu. Learn more about how their fishermen source ahi to provide you with the most delicious bowls and boxes. Ahi poke may feature one of two types of tuna: yellowfin or bigeye. Yellowfin tuna is a diverse species characterized by a streamlined body, firm texture, and mild flavor. In contrast, bigeye tuna has a more robust body and higher fat content, making it ideal for sashimi. Both fish have distinct yellow markings and range in size. Most landed yellowfin are between 3 and 100 pounds. Bigeyes typically range from 20 to 200 pounds. All are sustainably sourced in Hawaii, thanks to the state’s responsible catch quota regulations. The largest Hawaii yellowfin tuna and bigeye tuna are usually caught in offshore waters. Fishermen use longline gear with a central fishing line 1 to 50 miles long. These lines include bait hooks spaced at even intervals. While efficient, the method does have the potential to catch other fish, turtles, and birds. Others fish on pole and line boats, trollers, or handliners. The pole and line method uses bait to catch smaller tuna, and does not target other marine animals. However, the simple technique yields a small supply. Trolling gear drags bait through the water on fishing lines. This sustainable option also harvests plenty of ahi. Handline tuna is an inexpensive, manual method. Using a single vertical fishing line and hook, this centuries-old Hawaiian practice does not yield a lot, but it is ideal for handpicking large bigeye and yellowfin. Whether you prefer yellowfin or bigeye, the fresh fish in your ahi poke is always sourced responsibly and sustainably. Now, it’s time to enjoy a bowl or box customized with your favorite sauces and toppings at Poke & Box. To learn more about their delicious menu, visit the website or call (808) 394-7633. See updates and photos of delectable ahi poke combos on their Facebook.